Home / Uncategories / Sana's Ramblings Turns 3 International Giveaway !!! 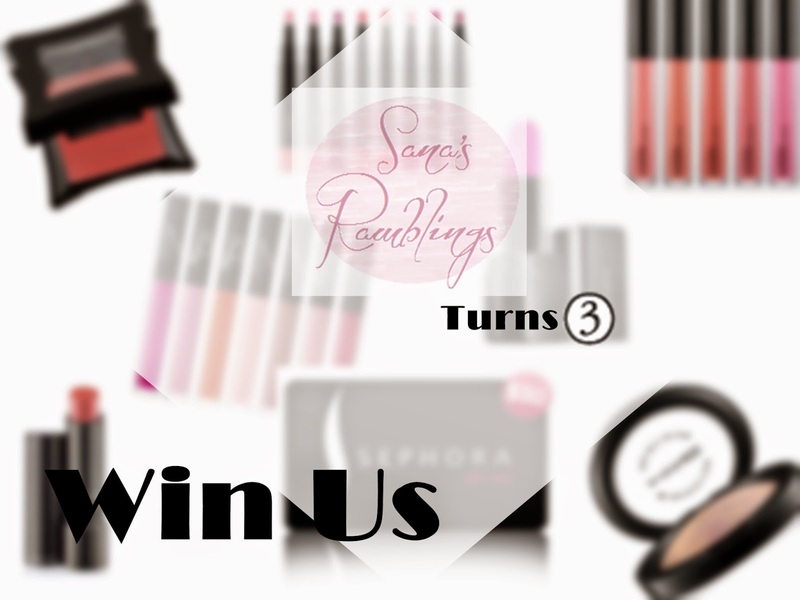 Sana's Ramblings Turns 3 International Giveaway !!! Since I'm celebrating my blog's 3rd anniversary I present you a massive giveaway on the cards and here's the sneak peak of what's in store for you-something better, bigger and exciting. I was running short of time, therefore I only managed to do what best I could do in such a short time whilst running errands. I'll be announcing an exciting, the bigger, the better giveaway soon where you can win $50 Sephora Eard and amazing goodies from MAC, NARS, Rimmel London, Illmasqua and Sally Hansen. I am not able to return your immense love and support but I've tried to give my little piece of love and care for you all out there. You HAVE to like Sana's Rambling's on FACEBOOK. Fill the Rafflecopter form below with all MANDATORY entries. Do remember, without following the mandatory steps your OPTIONAL entries won't be accepted and entries submitted through rafflercopter will be acceptable only. I'll be choosing EIGHT winners and all of them will be chosen randomly via random.org. Giveaway will end on 31st October 2014. 31 comments on "Sana's Ramblings Turns 3 International Giveaway !!!" Love this giveaway, hope to be one of the lucky eight. My comments are not visible. I am entering the rafflecopter daily and commenting on blog posts too. Wow,this is a lovely and generous giveaway,thank you so much Sana,i hope i m gonna be one of the lucky winners. Congrats for blog's 3rd anniversary! I would love to try this stuff - hope I can win!! Thanks for the chance! When The winners will be announced ?? Thank you in advance, have a great day!